Last week, as a Dallas police officer struggled with a suspect, only one person stepped in to help. 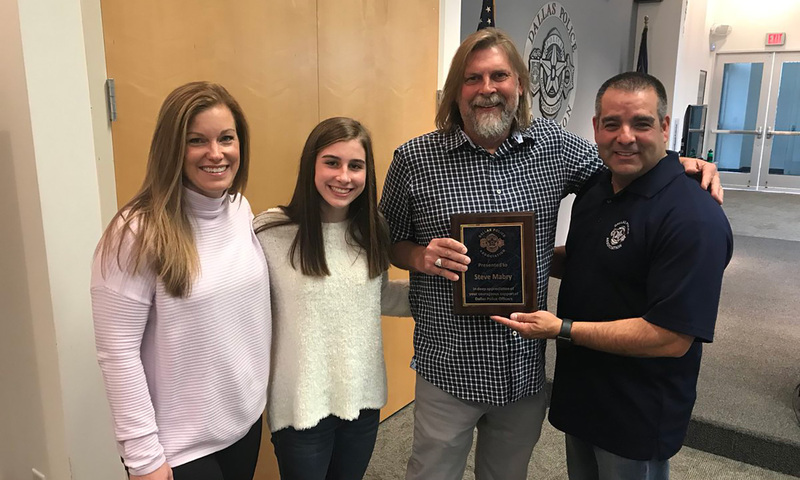 The Dallas Police Association honored him on Wednesday. “As the officer was on the ground trying to place this person under arrest, we had numerous citizens who unfortunately stopped and thought it was necessary to videotape it,” DPA President Mike Mata said. Steve Mabry acted differently. As he was driving down Ross near Henderson last Friday, he saw the officer on the sidewalk struggling with a suspect trying to take his taser and he stopped to help him. He pinned down 30-year-old Tetus Powell, believed to be high on PCP, until backup arrived to arrest him. The DPA presented Mabry with a plaque. Mata said because of his heroic actions, the officer was able to go home to his family and his newborn son. “I’m a little overwhelmed and I don’t think I deserve a trophy for doing the right thing,” Mabry said. The DPA also presented Mabry with a gift card to take his family out to eat over the holiday weekend. The suspect arrested in Friday’s incident has an extensive prior criminal history. Powell has been arrested in Dallas County more than 20 times. Couple loses engagement ring in NYC proposal mishap. Police — and internet — come to the rescue.